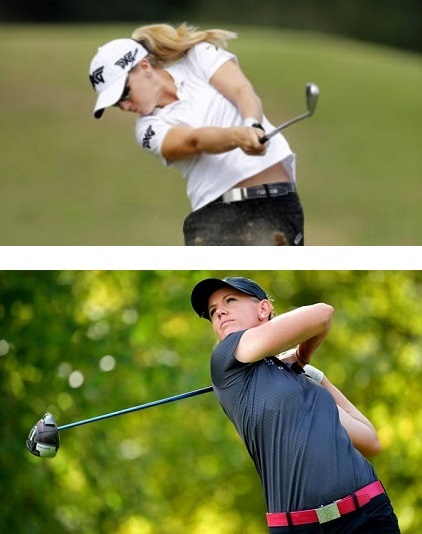 Nexbelt® Tour Staff Professionals Austin Ernst and Amy Olson capture Top 5 Finishes on the LPGA Tour – "The Home of Organic Golf Reviews"
In the near future look for a review of the Fast Eddie Collection. A belt from Nexbelt that I had the opportunity to test and review. Spoiler Alert: It tested well. With a minor suggestion. In the meantime, enjoy this press release outlining achievements by a couple of LPGA Tour Nexbelt athletes. (Rancho Cucamonga) – Nexbelt, The Fastest Growing Belt in Golf, captured two Top 5 Finishes on the LPGA Tour this past weekend. In Evian-Les-Bains, France, LPGA Tour Players Austin Ernst and Amy Olson both finished at 11 under par, just one stroke off the lead, to capture T-2nd Place Finishes at the Evian Championship. Austin Ernst recorded rounds of 66, 70, S69 and 68. This is her fifth Top 10. She is currently ranked 32nd in the Rolex Ranking and 13th in the Race to the CME Globe. Amy Olson shot rounds of 69, 65, 65 and 74 and led the event for much of the final round. This was her 3rd Top 10 of the season and she is currently ranked 48th in the Rolex Ranking and 30th in the Race to the CME Globe. With over 50 players now wearing Nexbelt on the PGA, LPGA and Champions Golf Tours, it’s considered “The Fastest Growing Belt in Golf”. Its team of PGA TOUR Staff Professionals for 2018 includes Tour Players Jim Furyk, Kevin Na, William McGirt, Jason Bohn and many more. Nexbelt is known for its innovative technology and providing golfers with the maximum comfort and minimal adjusting. The unique ratcheting system called PreciseFit allows the wearer to adjust the belt in ¼ inch increments, providing the golfer with the best fit, feel, and fashion available. Nexbelt is 100% committed to offering its customers superior customer service and the most innovative and technologically advanced products available.